The division provides a full spectrum of neurological consultative services for patients in southeastern Ontario. Patients are seen only with physician referral. The Division provides specialized outpatient clinics in several areas of subspecialty neurology as well as general clinics. An urgent clinic is also available. These clinics are located at Kingston General Hospital. There are outreach clinics in Smith's Falls and Brockville. The inpatient neurology service is integrated with neurosurgery at KGH, along with the neurosciences critical care unit. Consultation service for inpatients is provided by the Division in the Queen's University teaching hospitals. There is an active academic program in neuropathology also located at KGH. The Division provides clinical neurophysiology services for the teaching hospitals and several community hospitals. Kingston General Hospital is the site of a Regional Stroke Program, funded by the Ministry of Health. 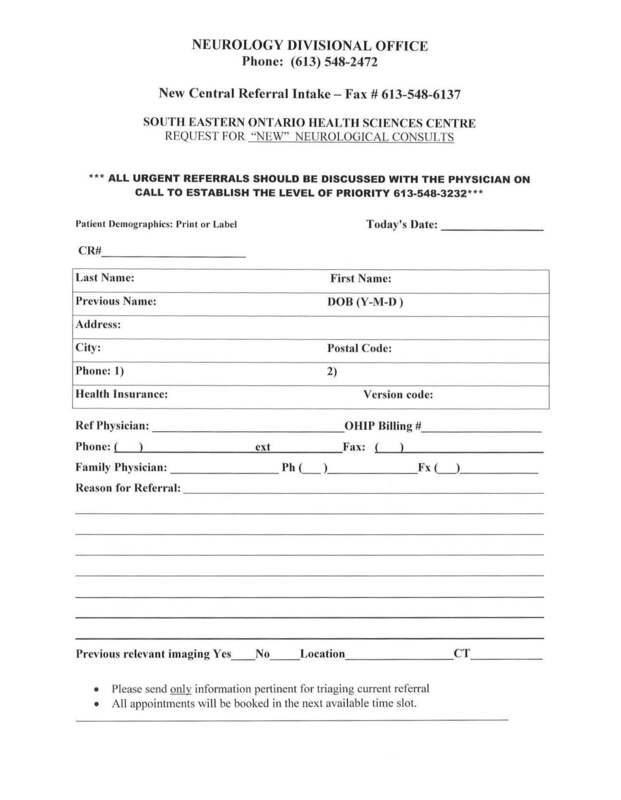 Download the referral form for 'New Neurological Consults". Please complete and fax to 613-548-6137.